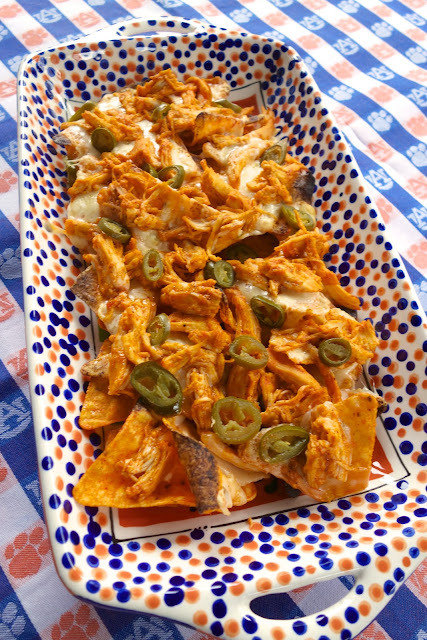 These nachos were inspired by one of my favorite Auburn restaurants, Momma Goldberg's. Momma G's nachos are very unique. 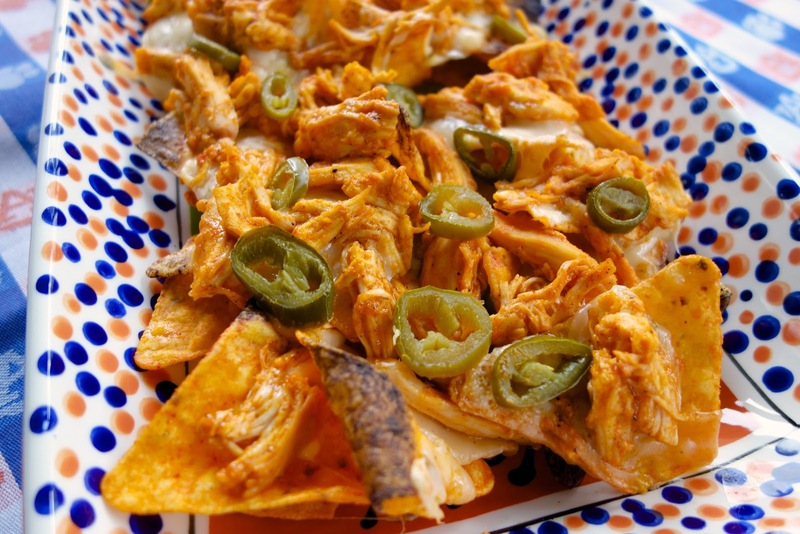 They make their nachos with Doritos, jalapeño jack cheese slices and jalapeños. I decided to kick up their version with some buffalo chicken. O-M-G! Delicious! I love Doritos and buffalo chicken, so these are right up my alley. 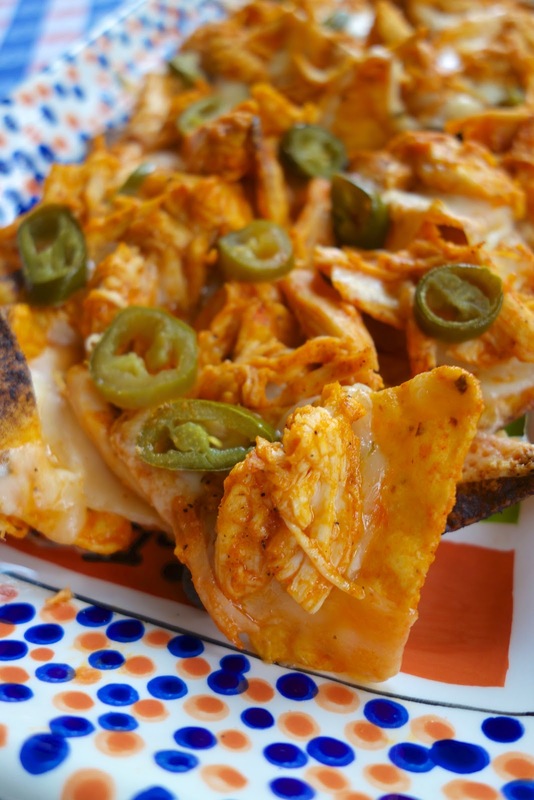 These nachos are very easy to make and are great for a party. They go quick; be prepared to make lots! I like to make an assembly line so a new batch is always ready to go. I assemble the nachos on foil and then pop them under the broiler when I need them. Add these nachos to your next tailgating/couchgating party! Toss cooked chicken with wing sauce. Place Doritos in a single layer on baking sheet. Spread the cheese slices over the chips evenly to the rim. Using tongs, spread the saucy chicken around the tortilla chips. Top with jalapeño slices. Broil in oven until cheese is melted completely (should toast quickly). Transfer nachos to a serving platter. What about mixing a little Ranch in the buffalo sauce? Or a drizzle after the broiler? Suzanne - that sounds really, really good!! Looks GREAT and I LOVE the AU Platter. WAR EAGLE!! Agree with Terry, love the Auburn platter! O.M.G. Girl after my own heart. These look amazing!! i made these for dinner this past Wednesday night except i used the whole grain tostito chips, and i used the recipe for daytona chicken instead of straight wing sauce. my husband and i ate the entire pan. it was delicious!